Hazard Scout comes with a few pre-packaged reports such as the "Near-Miss Report". You can change the order of these reports, hide, edit, or even delete them. Most likely, you'll want to create your own report (aka Form) in order to collect company-specific data. Here we will walk through the creation of a simple Audit Report. The questions will be different on your report, but this should give you an idea of how you would go about creating your own report. Hidden? - check this box if you'd like to temporarily hide the form. You will still be able to view responses, but the form will not be listed. Press "New Field" > "Select"
Enter "Quality" and press "Create"
Check "Yes, this is required"
Set the style to "Rating"
Now the user can select a "Quality" rating. Now let's have the user enter a description. Press "New Field" > "Textbox"
Enter "Description" as the title and press "Create"
Choose "Quality" > "Poor" > "Continue"
Now the description field will only show up if "Quality" is "Poor". Instead of listing "N/A" over and over, this allows us to only show fields when they are relevant! We could be finished with our new report, but let's add a signature field first. 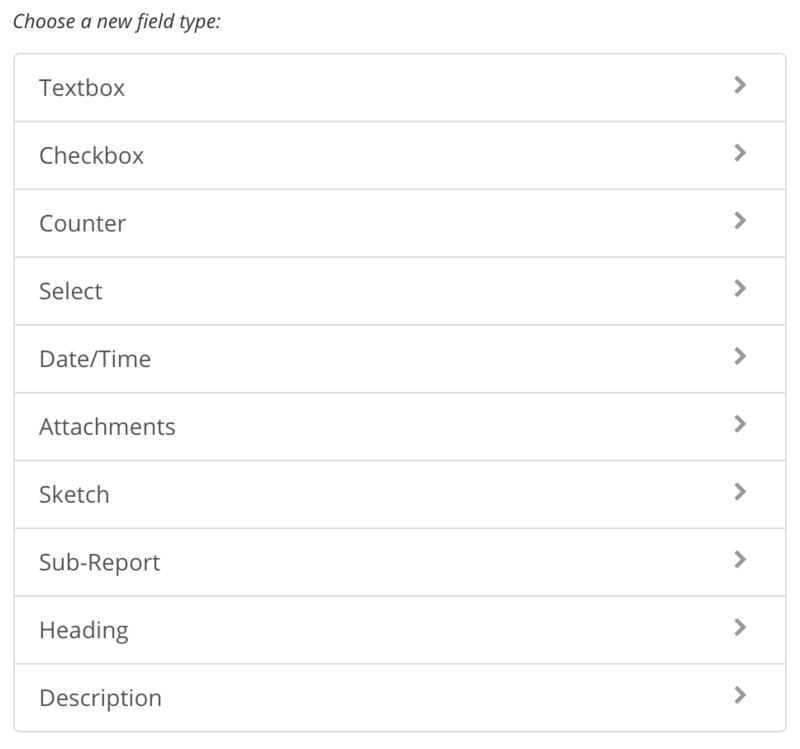 Press "New Field" > "Sketch"
Enter "Sign Here" as the title and press "Create"
Now we can see what it looks like to fill out our new report. The form will automatically show up on the website. NOTE: For employees using the Hazard Scout iPhone and Android apps, the reports are downloaded daily. You can force the app to download the latest reports by pulling down on the home screen and pressing "Check for Updates". As expected, the Description field is hidden unless we choose a "Poor" quality. NOTE: In this example, we are logged in as an admin which means we have "surrogate" permissions. That means we can submit the report on behalf of someone else so we see two additional fields at the top: observer and date. Now you can begin viewing responses by going to "Reports" > "Audit Responses". All reports give you the option to filter by date, observer, GPS location, and pending follow-ups. You will also be able to filter based on the questions you created. In this case, we have a Quality filter and a Description filter. Below, you will see individual responses listed. You can click each one to view that specific response. You will also see other outputs such as "Quality". This automatically generates a visualization of the data based on your questions. You can automatically filter your notifications based on the questions you created. Scroll down to your report and press "Turn On"
Select "Add A Condition..." then "Quality" > "Poor" > "Continue"
Now you will receive a push notification on your iPhone when a report is filled out with the quality set to "Poor".